"Alpacas... huh." That was the thought in my head as I woke up one morning in August, 2015. Brian was in Germany at the time, and I immediately wrote him an email that I signed off as "it's a thing!" Since that time, "it's a thing" has turned into a standard response for both of us. Brian's dad raised cattle, and though he'd been around them his entire life, he had no real interest in them. And me? I'm a "city girl." Other than some aquarium pets, I've never even really been around animals. We took this picture at the first alpaca farm we visited, and absolutely fell in love. Through sheer coincidence (or fate! ), our photo-op girl (Beate) ended up being one of our first alpaca purchases. 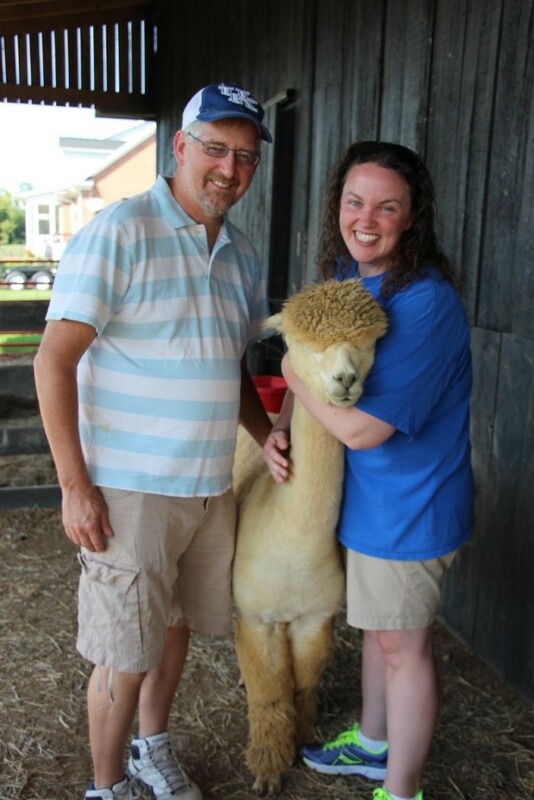 Alpacas made sense for us, though I have to admit we've raised a lot of eyebrows during this startup of our journey. We usually answer the questions with, "it's a thing!" What other kind of livestock will let you love on them like this? Imagine putting your arms around the neck of a cow. Or a chicken. 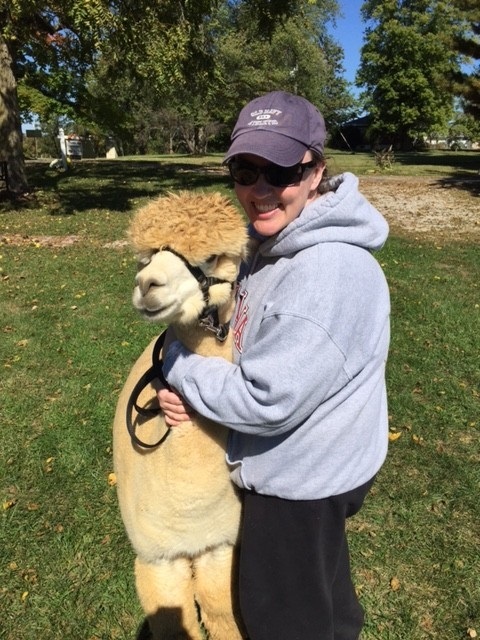 On the other hand, our alpacas LOVE being loved on. Continuing the concept of being kind to the earth - their poo is an amazingly wonderful soil amendment. Because of the low nitrogen level, it can actually be applied directly to plants without burning; however, at S&B we feel that an aging/composting process increases the benefits and nutrients given to the plants. Stay tuned for more information regarding our composting program. Alpacas only have bottom teeth. This means no biting. Even at 8 months pregnant, our biggest girl (Jewel) was only about 150lbs. Have you ever felt alpaca fleece? Warmer than wool, not itchy, hypoallergenic... and incredibly soft. S&B Bell Farms is located in Hodgenville, KY – a short distance from Elizabethtown.